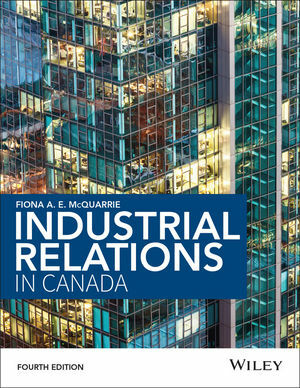 I’m very pleased to announce that the 4th edition of my textbook Industrial Relations in Canada, published by John Wiley and Sons Canada, is now officially on sale. Creating the new edition of the book was a lot of work, and as always it was a great pleasure to work with the team at Wiley Canada on this project. I’m very grateful to everyone at Wiley and everyone else who participated in making this edition happen. The 4th edition has all new cases, updated statistics and news stories, and discussions of current issues such as recent Supreme Court decisions involving labour issues, and changes to Canadian labour law. The book is available in a print version and as an e-book. You can purchase it in either form here.